Critically acclaimed punk rockers Donots release the physical edition of their new album ‘¡CARAJO!’ today, Friday, May 13th via OK!Good Records. 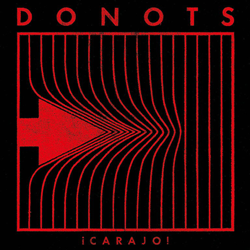 German punk band Donots are excited to announce that their tenth studio album ‘¡CARAJO!’ is now available for physical purchase. ‘¡CARAJO!’ was previously only available for digital purchase and streaming; however today, Friday, May 13th the album has been made available for physical purchase in music retailers nationwide. The North American release of ‘¡CARAJO!’ is the English version of the previously released German language album. The band’s first German language release received rave reviews throughout Europe where it reached the Top 5 Chart marking the band’s highest chart position to date. The fourteen track album displays the band’s versatility and musical skill, which they have perfected after twenty plus years of recording and performing together. The album journeys through topics of friendships, relationships, disappointments, and hope. ‘¡CARAJO!’ consists of uplifting powerhouse tracks such as “Damage,” melancholic wave pop tracks like “Camden Station, 1AM,” and sing-a-long punk anthems such as “Not Part of It;” which has become an anti-Nazi anthem throughout Germany during the ongoing refugee crisis. The album has been described as the band’s most political record to date. ‘¡CARAJO!’ captures the past, present, and future sound of the veteran punk band. ‘¡CARAJO!’ is now available for physical purchase in music retailers nationwide. The album is also available in the OK!Good Record web-store, Amazon, and Bandcamp. The album is available for digital purchase on iTunes, Amazon, and Google Play. It is available for streaming on Spotify and Bandcamp.